The FRS ferry from Tangier to Tarifa was a large jet catamaran, which crossed the Straits of Gibraltar with consummate ease. We arrived to find Tarifa, acknowledged as the kite surfing capital of the world, windy. Fortunately we had booked a room for the night just around the corner at The Benali Guesthouse, so we arrived not too wind swept, but very interested. Check in was a bit of a problem, as there was no one there, the door was locked and we didn’t have the code. What to do? As it turned out, do very little and the lovely young man from the bar next door will let you in. Gracias, muchos gracias. The room however was very nice and best of all the aforementioned young man and bar next door. The bar LOLA, is a small, inexpensive tapas, wine and flamenco bar where we spent a pleasant evening eating tapas and enjoying what we thought was Sangria (it turns out Sangria is only for tourists and not found in local Spanish bars), but which turned out to be a version of Tinto de Verano, a volatile mix of a white rum, of some suspicious local origin, generous ice, orange and lemon slices, red wine and finally a dash of lemonade. One was delicious, two were heaven, three were deadly. Ian woke up with quite a hangover, which didn’t help our departure. We had planned to catch the free bus provided by RFS ferries to Algeciras, however as the wind had decided to take it up a notch for the day, the ferry and subsequently the buses had been suspended. Fortunately we found a taxi driver who was willing to take us to Algeciras for €30. On arriving in Algeciras, we managed to snag a bus to the railway station at Málaga for €15 each and from there it was into a hire car and on our way. Driving out of Málaga was a relatively straightforward process, with the aid of our trusty heremaps program and in no time we were travelling down the freeway to the Cartarma turnoff and then wound our way through the hills to the village which would be our home for the next two weeks. Álora is a small village on the edge of the Sierra Madre in Ándaluciá. It is one of the Pueblo Blanco, which sprinkle the hills of Ándaluciá and we can tell you it is drop dead gorgeous. In this part of the world, the hills rise steeply above the valleys, which are filled with orange, lemon and olive groves while the villages cling to the steep hillsides tenaciously. Narrow cobbled streets climb up the slopes, turning this way and that without any seeming logic, suddenly plateauing into a beautiful plaza replete with fountains, a lemon tree or two and of course a couple of tapas bars, where one can rest their weary feet and enjoy an ice cold beer. 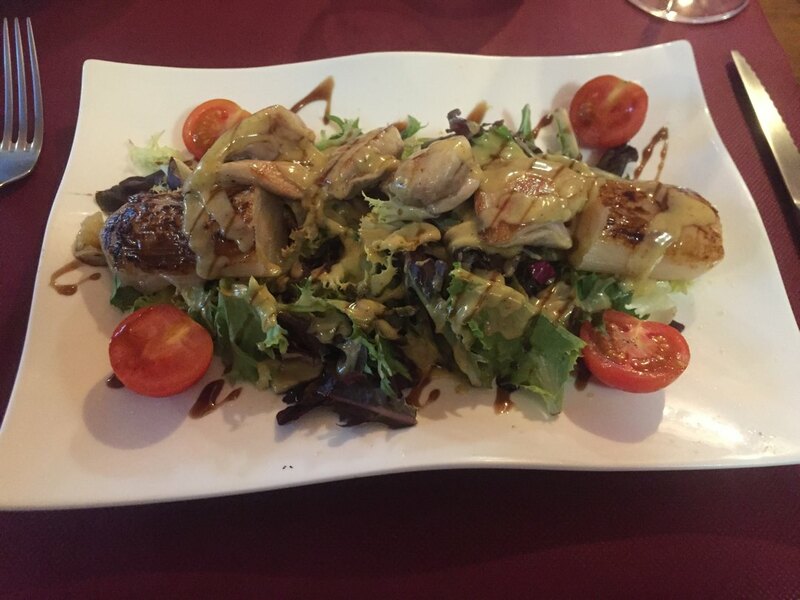 As if this isn’t enough, the tapas are simply divine. At our first and to become our favourite bar in Alora, D’Kañas, we started with crumbed and fried cheese drizzled with raspberry sauce, followed by curried chicken and rice,YUM. We planned to enjoy a night out a little later so settled for one further dish, champignons with cheese and bacon. Wow! 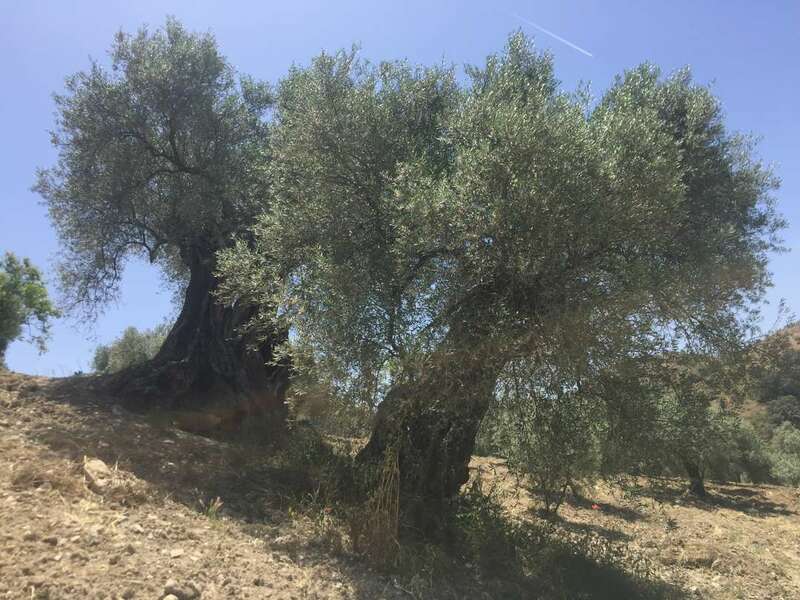 We had heard about the millennium olive tree, certified as being 1000 years old by the Cordoba university and so on our second day, we took a trip near to Casabermeja near Antequera, to find this marvel. A bit of a navigational nightmare for the technology reliant traveller as it is not marked on a map, but hidden in, of all things an olive grove surrounded by farm land. 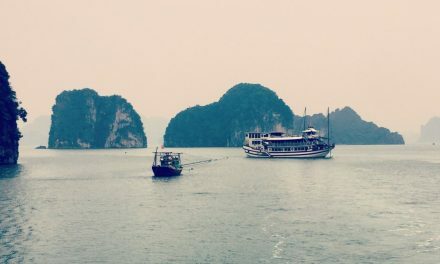 After a bit of tramping around in the dirt, we think we found it, a true marvel of nature. The Spanish countryside in Ándaluciá is very pretty, alternating as it does between lush green valleys filled with orange groves and steep hillsides crowned by enormous granite outcrops. Whilst the back roads are seemingly narrow, they are generally wide enough for two vehicles to pass and allow the driver to relax a little more than in some of the minuscule country roads we had experienced in England. And of course, once back on the mainstream highways, we have to admit the Spanish have done a marvellous job. Freeways are clearly marked, multi laned and traffic is generally well behaved. Monday found us ready for a lazy day in Álora after our trip to Córdoba and so it was that after a quiet lunch at a local taverna La Casa del Abuelo, of calamari and pork chops, prefaced by a rather enjoyable Gazpacho Andalucia, we decided to climb up to the castle, the Castillo de Álora. 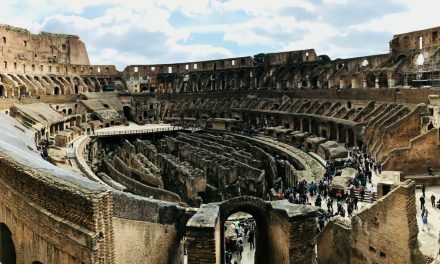 Originally built by the Phoenicians, it was subsequently reconstructed by the Romans, destroyed by the Visigoths and once again reconstructed by the Moors. It has had a chequered history and was the scene of mass executions by Franco’s Death Squads in 1937. Unsurprisingly, it was the town cemetery until recently. It is a simple structure but commands a wonderful view of the surrounding districts and must have been quite impressive in its day. It open for limited hours and thank heavens we had made the trek on a day when it was open because it is a steep climb up cobbled streets but the view is to die for. 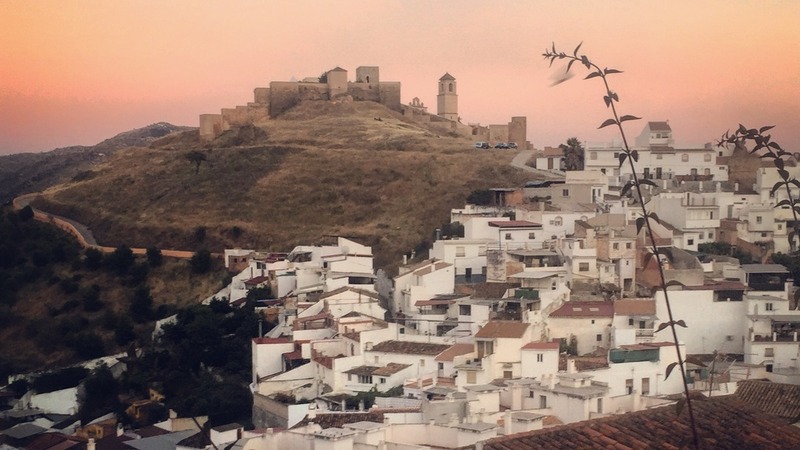 The south of Spain is pretty hot in May and we welcomed siesta on most days but after lunch and the climb to the castle, it was definitely time for a Tinto, as we now referred to it and a good lie down before watching the sunset over the hills and town. Our apartment had a fantastic terrace, conveniently shaded in the late afternoon. The perfect spot for a drink and dinner. Another win for AirBnB. We decided on Tuesday, let’s be honest, to try and find some cheap booze. We had been informed by a friend that in Spain the overproduction of wine, which couldn’t be bottled and sold normally was often available in bulk from the olive oil pressing companies. So it was that we headed off to a nearby Molino to ascertain the truth of the matter. Sadly the local producer had none and so, faced with a reasonable drive home, we decided to go for a look at a nearby village. 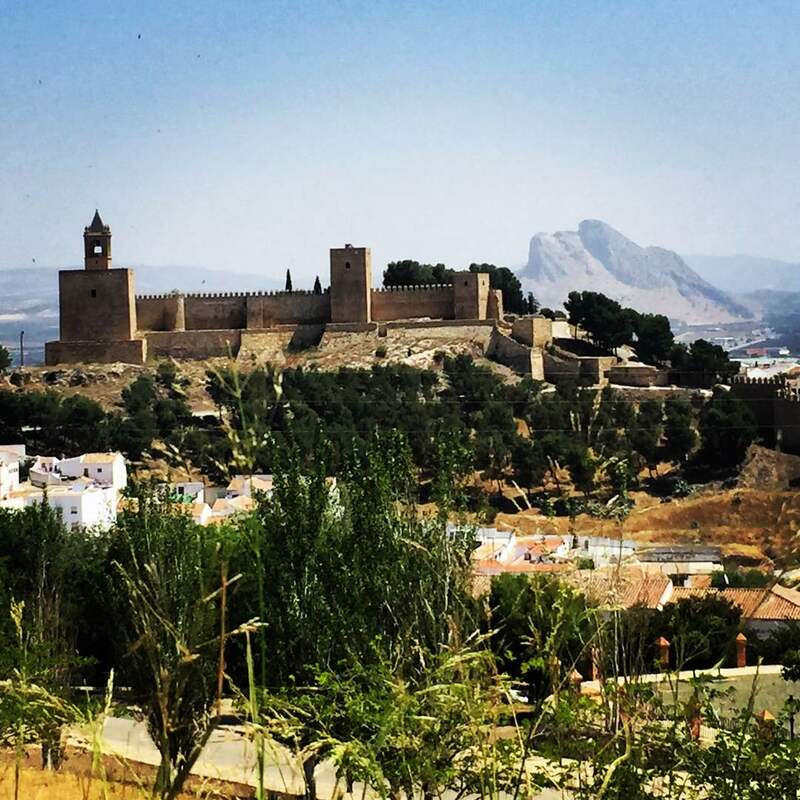 Having read a little about other Puebla Blancos, we decided to check out Ronda. Wednesday was declared a relaxing day and we achieved it with aplomb, culminating in a visit to the Tapas Bar, D’Kanas Cerveceria. Without doubt our favourite haunt in Álora. We needed to have a relaxing day as we planned to walk the Caminito del Rey on Thursday, which according to the website would take both fitness and nerve. After Caminito del Rey, Friday was unanimously declared a rest day. Apart from a trip up into the village, where we stopped in for tapas at Casa Romero, we rested. The food was not quite up to the standard of our favourite bar but one must aim for fairness and try each bar in town. Don’t you agree? 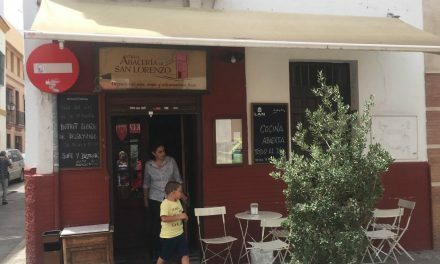 Saturday was devoted to blog writing and drinking Tinto de Verano, which was an easy task, but by late that evening we heard roars from across the village and realised it was the European Champions League Final, featuring Real Madrid and Juventus. Cath checked and sure enough Real Madrid had scored a goal so we headed off to D’Kanas Cerveceria and watched the second half. For those who don’t know the result, Real Madrid kicked Juventas arse and everyone in town went off like a bucket of prawns. We slept very soundly indeed after the celebrations. Sunday found us a little bleary eyed and we decided to call it off due to lack of interest. We spent the day blog writing and messing around on the internet or as we now call it, planning. 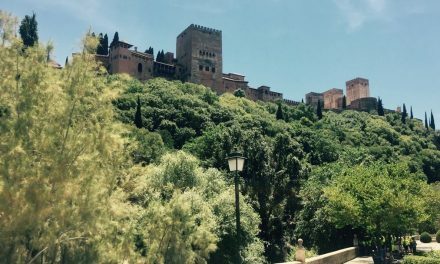 A couple of days doing not much are truly valuable when you are travelling and we were aware that the next promised plenty of walking in Granada. The day following our trip to Granada was to be our last day in beautiful Álorá, which we had come to love. The whitewashed buildings, the distant views, the swooping swallows, the long warm evenings, the yummy tapas bars. We could go on for hours about it, but we must also mention the happy and friendly people, who are to be seen of an evening out with their children and families, clearly having a lovely time well into the late hours. Considering it doesn’t get dark until after 10:00, it is surprising the kids aren’t bleary eyed each morning. On the other hand, maybe they are. As we have slipped into the local lifestyle, early mornings have become a thing of the past for us. For our last night in Álora, we decided to treat ourselves to a full restaurant meal at a delightful little restaurant hidden around the back of the small church between the two upper squares. The Casa Abilio is run, it seems, by two brothers. One to do the cooking and the other, the table service. The wine selection was quite extensive, but we determined to stick with a local wine, Flor Floris 2014, from the Sierra De Malaga. It proved to be a good choice, but the meals were so good, they eclipsed it. We left so glad that we had not found this gem earlier but left it to the last minute, our lasting memory of a gorgeous little Pueblo Blanco.